Chris Martin - Howe of Fife. Chris Martin says his Howe of Fife side will play without fear when they travel to meet league leaders Biggar this weekend. The hosts have swept virtually all before them in the Tennent’s National League Division 2 this campaign, tasting defeat just once in their opening 15 games. They’ve scored an incredible 527 points and conceded just 87. 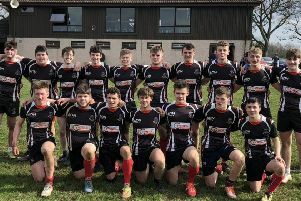 It’s an ominous task, but one Howe can be quietly confident about and will head into with a spring in their step after Saturday’s 36-22 home win over Whitecraigs at the weekend (match report page 53). What has been a depleted Howe squad over recent Saturdays was boosted by the return to action of several key players. Martin said: “It was certainly a morale boost. “Having the guys back in the squad and having 19 players available was big. Having the weekend off the week before did us a lot of good and we were able to have three training sessions. “We all knew it was a must win game but nobody really mentioned it. Howe’s win, against a side which went into the game a few places above them, was all the more impressive given that it was Whitecraigs who took the lead. But, despite having suffered a few defeats in recent weeks, Howe remained resilient and refused to let their heads go down. “The guys know that during points of a game we’re not going to have things all our own way,” added Martin. Once Howe got their noses in front there was no catching them, despite Whitecraigs reducing the deficit late on. “Last Thursday I was confident we would win, our preparation had been that good,” added the Howe head coach. Attention now turns to Biggar, and Martin is determined to build on the positive result. “We’re under no illusions about how difficult it is because they’re top of the league,” he said. “It’ll test the players and also give us a chance to see our strengths and weaknesses against a good side. “It’s an opportunity for us to go there and cause an upset.